Twin Valley South senior Willie Bowman was a second-team All-Southwest District pick in Division III. PREBLE COUNTY — Twin Valley South senior Willie Bowman was a second-team All-Southwest District pick in Division III. Four other county players were also honored. Twin Valley South senior Jayden Bassler was an honorable mention pick. National Trail sophomore Cameron Harrison and junior Zach Woodall were named honorable mention. Preble Shawnee sophomore Bryce Singleton was an honorable mention selection. 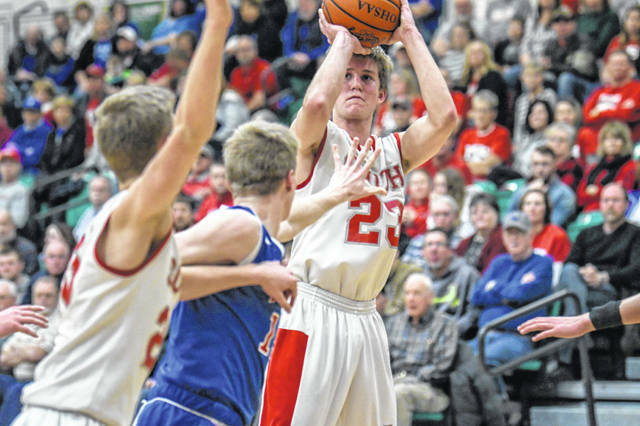 The 2018-19 All-Southwest District boys basketball teams were selected by a media panel from the district. FIRST TEAM: Amari Davis, Trotwood-Madison, 6-foot-4, senior, 30.1 points per game; D’Arris Dean, Cincinnati Aiken, 6-0, sr., 21.9; Joey Edmonds, Cin. Wyoming, 6-0, sr., 19.0; Milton Gage, Dayton Chaminade Julienne, 5-11, sr., 17.9; Paul McMillan, Cin. Hughes, 6-2, sr., 25.1; C.J. Napier, Franklin Bishop Fenwick, 6-5, sr., 19.3; Nekhi Smith, Cin. Taft, 6-6, jr., 22.4. PLAYER OF THE YEAR: Amari Davis, Trotwood-Madison. COACH OF THE YEAR: Joe Staley, Chaminade Julienne. SECOND TEAM: Carl Blanton, Trotwood-Madison, 6-3, jr., 18.5; Twon Hines, Dayton Northridge, 6-1, sr., 21.5; Dionte McBride, Woodward, 6-3, sr., 27.0; Anthony McComb, Dayton Thurgood Marshall, 6-2, so., 17.0; Thomas Myers, Clarksville Clinton-Massie, 6-6, sr., 15.2; Evan Prater, Wyoming, 6-5, jr., 17.0; Darren Rubin, Oakwood, 6-0, jr., 22.2. Griffin Laake, Brendan Lamb, Clinton-Massie; Jonathan Lang, New Richmond; Malachi Mathews, Trotwood-Madison; Camron McKenzie, Hughes; Jack Nauseef, Chaminade Julienne; Evan Noffke, Springfield Northwestern; Cooper Shields, Ross; Noah Walker, Greenville; Cam Coomer, Wilmington; Jason Griffin, Batavia. FIRST TEAM: Griffin Doseck, Anna, 6-foot-5, senior, 15.0 points per game; Alex Dotson, Cincinnati Purcell Marian, 6-4, sr., 13.3; Trevon Ellis, Dayton Stivers School for the Arts, 6-3, jr., 13.0; Jacob Gudorf, Brookville, 6-3, sr., 15.2; Brayden Sipple, Blanchester, 6-4, so., 26.2; Grant Whisman, Middletown Madison, 6-7, jr., 16.7; Mark Wise, Cin. Deer Park, 6-4, jr., 18.0. PLAYER OF THE YEAR: Mark Wise, Deer Park. COACH OF THE YEAR: Felix Turner, Stivers. SECOND TEAM: Willie Bowman, West Alexandria Twin Valley South, 6-3, sr., 19.6; AJ Garrett, Purcell Marian, 6-6, sr., 12.2; Steven Gentry Jr., Deer Park, 6-0, jr., Jr., 15.3; Brice Hill, Cin. Seven Hills, 6-5, sr., 15.4; Kendal James, Tipp City Bethel, 5-11, sr., 20.2; Brandon Ross, Reading, 5-9, sr., 15.4; Michael Stammen, Versailles, 5-10, jr., 15.4. THIRD TEAM: Ibrahima Athie, Deer Park, 6-6, sr., 17.7; Bart Bixler, Anna, 5-11, jr., 16.0; Cole Fisher, Cin. Hills Christian Academy, 6-2, jr., 18.3; Carter Gray, Arcanum, 6-4, jr., 15.6; Noah Pack, Georgetown, 6-8, sr., 17.5; Allen Lattimore, Stivers, 6-0, so., 14.0; Steven Noung, Cin. Madeira, 6-1, sr., 15.3; Skyler Schmidt, Batavia Clermont Northeastern, 6-7, so., 22.9. Javonta Lyons, Purcell Marian; Drew McKibben, Williamsburg; Levi McMonigle, Mason Whiteman, Madison; Ethan Rimkus, Bethel; Bryce Singleton, Camden Preble Shawnee; Wade Turner, Brookville; Anton Webb, Miamisburg Dayton Christian; Griffin Reinert, Bethel Bethel-Tate; Branson Smith, Lees Creek East Clinton; Cameron Brookbank, Georgetown; Jack Kolar, CHCA. FIRST TEAM: Ethan Conley, Arcanum Franklin Monroe, 6-foot-4, senior, 27.3 points per game; Adonis Davis, Springfield Emmanuel Christian Academy, 6-4, sr., 15.0; Sabien Doolittle, Springfield Catholic Central, 6-4, sr., 15.0; Hunter Muir, Ansonia, 6-3, sr., 12.6; Trent Platfoot, Jackson Center, 6-0, sr., 12.5; Erik Uszynski, Xenia Legacy Christian Academy, 6-4, sr., 16.1; Kaden Warner, Cincinnati James Gamble Montessori, 5-11, so., 24.9. PLAYER OF THE YEAR: Ethan Conley, Franklin Monroe. COACH OF THE YEAR: Carl Woods, Fairfield Cincinnati Christian. SECOND TEAM: Charlie Bertemes, South Charleston Southeastern Local, 6-2, sr., 17.6; Nick Brandewie, Fort Loramie, 5-10, jr., 8.0; Trey Dunn, Catholic Central, 5-10, sr., 10.0; Daniel Kearns, Russia, 6-5, sr., 11.4; Michael McCants, Gamble Montessori, 6-3, jr., 18.8; Aidan Reichert, Jackson Center, 6-4, so., 14.5; Logan Woods, Fairfield Cincinnati Christian, 6-2, fr., 12.9. THIRD TEAM: Andrew Clark, Yellow Springs, 5-11, sr., 17.5; Colby Cross, Cedarville, 5-10, jr., 17.0; Spencer Heuker, Botkins, 6-2, sr., 12.0; Roman Newsome, Legacy Christian, 5-10, so., 11.2; Cameron Rogers, Cin. Christian, 6-3, jr., 10.3; Fred Shropshire, Emmanuel Christian, 6-2, jr., 14.0; Lane Willoby, DeGraff Riverside, 6-0, sr., 13.6. DJ Howell, Union City Mississinawa Valley; Connor Jones, Bradford; Trent Koning, Cedarville; Joe Lusby, Aaron McCoy, Cin. Miami Valley Christian Academy; Alec Martin, Dayton Miami Valley School; Zane Paul, Botkins; Ashton Piper, Sidney Fairlawn; Miguel Ringer, KJ Swain Jr., Cin. Christian; Eli Rosengarten, Fort Loramie. https://www.registerherald.com/wp-content/uploads/sites/41/2019/03/web1_TVS-v-Greenview-rd1_5-1.jpgTwin Valley South senior Willie Bowman was a second-team All-Southwest District pick in Division III.